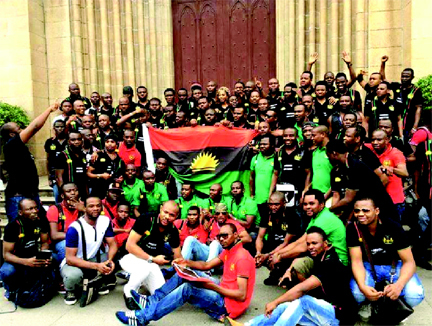 Sixteen persons suspected to be members of a splinter group of the Movement for the Actualisation of Sovereign State of Biafra have attacked a police station in Ogidi, Anambra State. The Divisional Police Officer in charge of the station, Mr. Hassan Musa, and four other police officers were injured in the attack. The incident, it was gathered, occurred on Sunday at about 9pm. The assailants were said to be armed with axes, machetes and other weapons. It was also gathered that they attacked the policemen at the gate before forcing their way into the station from where they made straight to the counter where the DPO was attending to official matters. “They hit the DPO and four other policemen severally on their shoulders, causing them serious injuries. One of the assailants was, however, shot on the leg as the attackers escaped from the station. He was arrested by the police. “The DPO is receiving treatment at a hospital in Ogidi. The identities of the attackers and their motives have not been established but one of the suspects caught, in his confessional statement, said they were members of a splinter group of a newly-formed Movement for the Actualisation of the Sovereign State of Biafra from Asaba, the Delta State capital. “He said they came to steal weapons from the Armoury,” the source said. The Commissioner of Police in the state, Mr. Sam Okaula, confirmed the attack. But MASSOB in a statement in Awka by its leader, Uchenna Madu, denied involvement in the attack.